The X-VU LiquidSkin is the first completely new 2-lense mask using LiquidSkin technology designed after the X-vision. Beyond the natural comfort provided by LiquidSkin skirt, an additional soft silicone part is injected in the nose area acting like an anti-shock bumper. The 2-button buckles are brand new and will be available by the end of the year together with optical lenses. Mares R&D and Design divisions have conducted numerous computer simulation and complex studies on the faces shape. The results are masks which combine great comfort with an incredible field of vision. Liquid Skin is a Bi-silicone exclusive technology. Two different types of silicone: a firmer portion for support structure and a softer portion for contact with your face, 45% softer on skin of unparalleled comfort. 270% greater elasticity for a perfect fit. 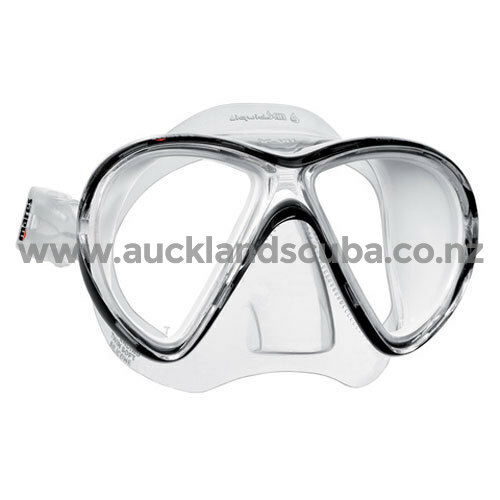 By attaching the buckles to the skirt masks have superior hydrodynamics because the strap fits closer to the head, making this a low volume mask, in addition the tension exerted by the strap acts on the skirt and not directly on the frame reducing the pressure of the frame against the face. For added comfort the X-VU uses Tri-Comfort Technology a softer material molded to the frame in the area of the forehead and nose. This soft material provides superior comfort during frequent or long dives. 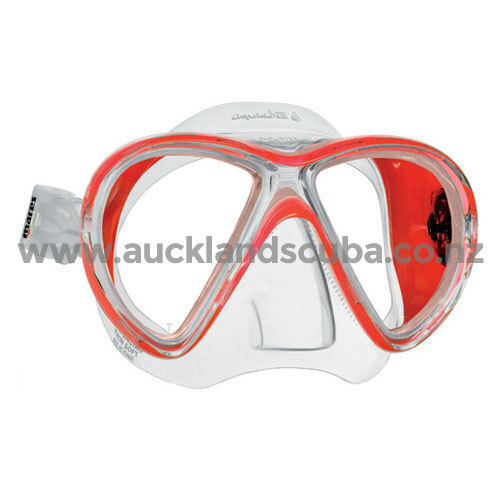 By attaching the buckles to the skirt masks have superior hydrodynamics because the strap fits closer to the head, making this a low volume mask, in addition the tension exerted by the strap acts on the skirt and not directly on the frame reducing the pressure of the frame against the face. 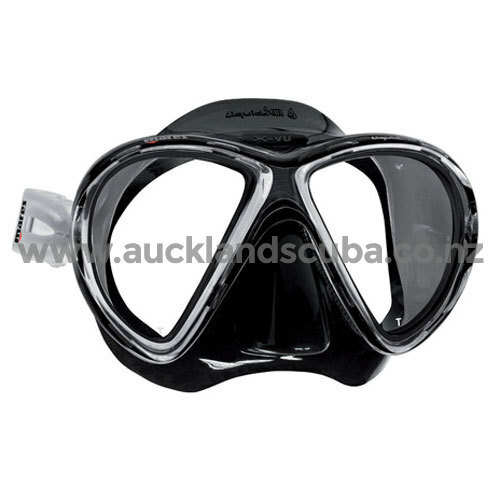 This low volume light weight mask has a skirt with a double feathered edge for an improved seal, easy to squeeze nose well allows one handed equalization, tempered glass lenses, quick adjusting buckles, with two colors in clear and one in black silicone.